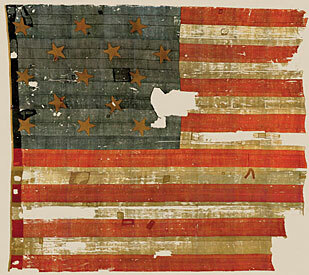 Con·sti·tu·tio·nal Rights: Rights and freedoms derived from the people themselves and protected primarily by the enumerated amendments to the US Constitution, the Bill of Rights.. Posts in this category pertain to legal, political, and philosophical matters regarding Constitutional rights. Congressional democrats promoting the use of the so-called "Slaughter rule" - a self-executing or "deem and pass" rule that would allow the House of Representatives to "deem" as passed the Senate health care bill without bringing the bill to the floor of the House for consideration are attempting to rationalize their actions by claiming that Republicans have used self-executing rules in the past, and that, therefore, their opposition to the Slaughter rule is hypocritical. On the surface, their claim sounds rather damning for Republicans, such as Mike Pence, who oppose the Slaughter rule. However, upon closer inspection, the democrats' claim proves specious. Democrats claim that Pence has voted for a self-executing rule three times. Let us examine those votes. Resolved, That upon adoption of this resolution, House Resolution 1000, amended by the amendment in the nature of a substitute recommended by the Committee on Rules now printed in the resolution, is hereby adopted. HR1000 was a resolution that amended the order of proceedings for the House of Representatives. It was not a legislative act. HR1000 was originally brought to the floor of the House, and was referred to and amended by the Rules Committee. The use of the self-executing rule in HR1003 merely allowed House members to deem as passed the resolution as amended by the Rules Committee, rather than bringing the resolution to the floor again. Thus, the use of the self-executing rule was intended to circumvent normal House procedure, not to avoid voting on HR1000. Verdict: the use of a self-executing rule in HR1003 in order to deem HR1000 as passed does not invalidate opposition to use of the Slaughter rule to deem the Senate health care bill as passed. Resolved, That the House hereby concurs in the Senate amendment to the House amendment to the bill (S. 1932) to provide for reconciliation pursuant to section 202(a) of the concurrent resolution on the budget for fiscal year 2006 (H. Con. Res. 95). The other chamber considers and passes the same bill. If the second chamber amends the bill as passed by the first chamber, either the first chamber must pass the bill as amended by the second chamber, or else (as is typically the case), the two chambers seat a Conference Committee to iron out the differences between the two versions of the bill. The outcome of this process is known as a Conference Report. Both the House and the Senate then each pass the Conference Report, and the bill is then presented to the president. The Senate passed S.1932 on November 03, 2005. The House passed H.R.4241 on November 18, 2005. The two bills were reconciled via Conference Report. The House passed the Conference Report on February 01, 2006, via H.Res.653. The Senate passed the Conference Report on February 08, 2006, via S.Con.Res.80. H.Res.653 deemed as passed a bill on which the House of Representatives had already voted: H.R.4241. H.Res.653 did not further modify the Conference Report for S.1932/H.R.4241. The Slaughter rule attempts to deem as "passed" the Senate health care bill, while at the same time amending that same bill. (The Slaughter rule "deems as passed" the Senate bill only upon House passage of a Reconciliation bill that amends the Senate bill.) Thus, the House will be engrossing a bill that it has at the same time amended. Verdict: the use of a self-executing rule in H.Res.653 in order to deem the S.1932/H.R.4241 Conference Report as passed does not invalidate opposition to use of the Slaughter rule to deem the Senate health care bill as passed. SEC. 2. Upon adoption of this resolution, House Concurrent Resolution 308 is hereby adopted. H.Res.572 merely deemed as passed a "technical correction" to a bill on which the House of Representatives had <em>already voted</em>: H.R.3058. H.Res.572 did not further modify the H.R.3058. The Slaughter rule attempts to deem as "passed" the Senate health care bill, while at the same time <em>amending</em> that same bill. (The Slaughter rule "deems as passed" the Senate bill only upon House passage of a Reconciliation bill that <em>amends</em> the Senate bill.) Thus, the House will be engrossing a bill that it has at the same time amended. Verdict: the use of a self-executing rule in H.Res.572 in order to deem as passed a "technical correction" amendment to the already engrossed H.R.3058 does not invalidate opposition to use of the Slaughter rule to deem the Senate health care bill as passed. Pence's opposition to the Slaughter rule cannot be considered to be hypocritical with respect to his previous support of self-executing rules in the House. None of his previous votes represents, supports, or justifies the intent of the Slaughter rule, since, in all cases in which Pence voted for a self-executing rule, he was doing so with respect to bills that had already been voted on and passed by the House. Not content with the denying the Minority to offer amendments and substitutes, the Majority has even refused to permit Democrats the chance to vote on the Majority's own bills. That is precisely what happened on June 12. This being the 23rd, that was 13 days ago. When the Republican leadership reported a self-executing rule providing for the adoption of the $82 billion plan over 10 years and an almost trillion-dollar plan over 20 years, accelerating the increased child tax credit for low-income people families, we didn't even get an opportunity to vote on the bill itself except by reference in a self-executing rule. What kind of lack of confidence does that display? What kind of process in pursuit of effectiveness does that mean that we are adopting? What kind of demeaning of democracy is the objective of efficiency resulting in? I would remiss to fail to note that barely 1 hour later, the House passed on a bipartisan vote -- you talk about bipartisan votes -- a nonbinding motion to instruct the conferees to accept the substantially more responsible Senate version of that bill, doing exactly the opposite of what a half an hour the House had voted on. Why? Because it had no full debate, and it was very ambivalent, and we knew the House was ambivalent, and you knew the House was ambivalent, and you were afraid, fearful that 12 or 15 Republicans, if allowed to vote on the substance as opposed to voting procedurally on a rule where party loyalty is so important, you were afraid to put the substance to the test of democracy, fearful that you would lose 12 to 15, and we would prevail in our position. House Democrats, of course, are trying to offer the same Senate bill as the substitute, but the Republican Majority blocked us from doing so. Wow, sounds bad, huh? Sounds exactly like the Slaughter rule, doesn't it? Notice, if you will, Hoyer's mention of conferees. Why, those would be the sitting members of a Conference Committee, who return Conference Reports. That means that the House of Representatives had already voted on and passed the bill in question. The Conference Report regarded H.R.1308, which passed the house by a voice vote. The self-executing rule to deem the Conference Report as passed was in H.Res.270, which passed by roll-call vote. When Hoyer claims that the minority didn't get to vote on the bill, he is lying. “We’re going to vote on a bill, on a rule, which would provide for the result that, if a majority are for it, that will adopt a bill, the Senate bill, which has had extensive debate, extensive exposure,” Hoyer said. All of the above uses of the self-executing rule apply only to amendments to bills already voted on and passed by the House of Representatives. As such, these House Resolutions do not justify the Slaughter rule to "deem as passed" the Senate health care bill, which the House has never brought to the floor for debate, much less voted and passed. All of the above uses of the self-executing rule apply only to deeming as passed Conference Reports for bills already voted on and passed by the House of Representatives. As such, these House Resolutions do not justify the Slaughter rule to "deem as passed" the Senate health care bill, which the House has never brought to the floor for debate, much less voted and passed. The above use of the self-executing rule applies only to specifying the procedures and rules of debate for other bills under consideration by the House. These self-executing rules do not deem any bill to be passed. The first represents merely a procedural motion, and the second tables a Conference Report. As such, these House Resolutions do not justify the Slaughter rule to "deem as passed" the Senate health care bill, which the House has never brought to the floor for debate, much less voted and passed. None of the referenced uses of a self-executing rule represent passage of a bill that has never been brought to the floor of, debated, and voted on by the House of Representatives. Thus, none of the above referenced uses of a self-executing rule justify, rationalize, or support the use of the Slaughter rule to "deem as passed" the Senate health care bill. The use of the Slaughter rule to "deem as passed" the Senate health care bill, which has never been brought to the floor of, debated, or voted on by the House of Representatives is, therefore, unprecedented. When the US Congress last year voted overwhelmingly to cut off federal funding of ACORN, one may have believed that Congress was exercising its constitutional authority to legislate the appropriation of government funds. According to activist liberal District Judge Nina Gershon, one would be wrong. ACORN sued the US Government, claiming that the de-funding legislation constituted a bill of attainder, the issuance of which, per Article I Section 9 of the US Constitution, Congress is expressly prohibited. Unsurprisingly, Judge Gershon agreed, and in December issued a temporary injunction against the congressional ACORN funding ban. Yesterday, she made that injunction permanent. "The Bill of Attainder Clause was intended not as a narrow, technical (and therefore soon to be outmoded) prohibition, but rather as an implementation of the separation of powers, a general safeguard against legislative exercise of the judicial function or more simply - trial by legislature." U.S. v. Brown, 381 U.S. 437, 440 (1965). "These clauses of the Constitution are not of the broad, general nature of the Due Process Clause, but refer to rather precise legal terms which had a meaning under English law at the time the Constitution was adopted. A bill of attainder was a legislative act that singled out one or more persons and imposed punishment on them, without benefit of trial. Such actions were regarded as odious by the framers of the Constitution because it was the traditional role of a court, judging an individual case, to impose punishment." William H. Rehnquist, The Supreme Court, page 166. The Supreme Court of the United States (SCOTUS) has construed several cases as representing bills of attainder. In Ex Parte Garland (1866), SCOTUS held that a law that prohibited Civil War opponents from holding public office constituted a bill of attainder. In Cummings v. Missouri (1866), SCOTUS held that the amendment of the Missouri Constitution to require an Oath of Loyalty constituted an ex post facto law that prohibited the plaintiff from practicing his profession, and constituted a bill of attainder as punishment without trial. "There was always a declaration of guilt either of the individual or the class to which he belonged." "But if it is not an ex post facto law, the reasons that establish that it is not are persuasive that it cannot be a bill of attainder. No offense is specified and no declaration of guilt is made." When the framers of the Constitution proscribed bills of attainder, they referred to a form of law which had been prevalent in monarchial England and was employed in the colonies. They were familiar with its nature; they had experienced its use; they knew what they wanted to prevent. It was not a law unfair in general, even unfair because affecting merely particular individuals, that they outlawed by the explicitness of their prohibition of bills of attainder. In US v. Brown (1965), SCOTUS held that a law that prohibited members of the Communist party from holding office in labor unions constituted a bill of attainder. In issuing his decision, Chief Justice Warren included several other historical examples of bills of attainder, including capital punishment, confiscation of property, corruption of blood (confiscation of one's estate such that it cannot be passed on through inheritance), banishment, disenfranchisement, and exclusion from holding public office. Warren also expressed that the historical context of the Bill of Attainder clause was intended to enforce the separation of powers and to prevent tyranny by preventing trial by legislature and punishment without trial. While the Bill of Attainder Clause serves as an important bulwark against tyranny, it does not do so by limiting Congress to the choice of legislating for the universe, or legislating only benefits, or not legislating at all. The Act's specificity in referring to appellant by name does not automatically offend the Bill of Attainder Clause. Section 12(f) does not inflict punishment within the meaning of the Bill of Attainder Clause. It imposes none of the burdens historically associated with punishment. It does not even deprive appellees of Title IV benefits permanently, since it leaves open perpetually the possibility of qualifying for aid. Note that this finding includes limiting the scope of attainder to "the burdens historically associated with punishment". To offend the Bill of Attainder clause, a law must declare the guilt of a person or group regarding a specific offense, and must then enact an attainder in response to that guilt. As is demonstrated in the above-referenced SCOTUS decisions, the concept of "attainder" consists of "the burdens historically associated with punishment" - those burdens being generally the deprivation of life, liberty, or property; corruption of blood; disenfranchisement; prohibition from holding public office; or prohibition from earning a living by practicing one's profession. Further, SCOTUS holds that the mere act of calling out a specific person or group does not offend the Bill of Attainder clause. These points are crucial to understanding the constitutionality (or lack thereof) of Judge Gershon's ruling. Plaintiffs acknowledge that HUD, pursuant to the OLC memorandum, has paid, or has agreed to pay, for work already performed under existing contracts. They contend that congressional suspension of existing contracts and the denial of the opportunity to obtain future contracts amounts to punishment that violates the Bill of Attainder clause. ...a law that legislatively determines guilt and inflicts punishment upon an identifiable individual without provision of the protections of a judicial trial. [F]irst, "whether the challenged statute falls within the historical meaning of legislative punishment"; second, "whether the statute, viewed in terms of the type and severity of burdens imposed, reasonably can be said to further non-punitive legislative purposes," an inquiry sometimes referred to as the "functional test"; and third, "whether the legislative record evinces a legislative intent to punish." A statute "need not fit all three factors to be considered a bill of attainder, rather, those factors are the evidence that is weighed together in resolving a bill of attainder claim." Having laid the groundwork, Gershon then proceeds to explain how the ACORN defunding constitutes a bill of attainder. To do so, she quotes liberally from Lovett, in an attempt to conflate the denial of duly earned salary of a government employee to the prohibition of issuing federal contracts to ACORN. The first problem with this conflation is that, in Lovett, the plaintiffs were duly employed government workers, and the law in question effectively fired them against the wishes of their employing agencies. On the other hand, ACORN is simply a government contractor: an agency attempting to procure government grants and contracts. Thus, the government-employee plaintiffs in Lovett had a reasonable expectation not to remain employed - even a right not to be fired without cause, while ACORN has no reasonable expectation of being granted future government grants or contracts - much less a right to the same. The government attempts to distinguish Lovett on the ground that the plaintiffs in that case had a "vested property interest" in their jobs, whereas here, as plaintiffs unequivocally acknowledge, the have no right to the award of a grant or contract from the federal government. but the Court in Lovett did not base its decision on property rights analysis. The Supreme Court found a deprivation amounting to punishment under the Bill of Attainder clause, not only because plaintiffs were derived of their earned income from existing government jobs, but also because they were deprived of any future opportunity to serve the government. As the Court stated, "[t]his permanent proscription from any opportunity to serve the Government is punishment, and of a most severe type." Id That plaintiffs had no right to any particular job was of no moment. Gershon's reasoning here is faulty. The government employees in Lovett were clearly "serving the government" in their employment. ACORN clearly was not. If anything, the government was providing a benefit to ACORN, through the awarding of grants and contracts. Further, the government work in which the Lovett plaintiffs were employed constitutes a chosen vocation, from which the statute in question effectively barred the plaintiffs. The ACORN defunding in no way can be construed to have, effectively or otherwise, barred ACORN from its chosen vocation - that vocation ostensibly being voter advocacy, and low-income housing and mortgage counseling. Further, unlike the plaintiffs affected by the statute at issue in Selective Service, plaintiffs here cannot avoid the restrictions imposed upon them. Nothing in the challenged provisions affords plaintiffs an opportunity to overcome the ban. "[I]t has been held permissible for Congress to deprive Communist deportees, as a group, of their social security benefits, but it would surely be a bill of attainder for Congress to deprive a single, named individual of the same benefit...The very specificity would mark it as a punishment, for there is rarely any valid reason for such narrow legislation[.]" Accordingly, a close reading of the cases indicates that a deprivation of the opportunity to apply for funding in fact fits comfortably within the definition of "punishment" for bill of attainder purposes. Quite to the contrary, the referenced cases are quite explicit regarding the scope of a "punishment" for bill of attainder purposes. That scope includes deprivation of life, property, or liberty (for example, to pursue a chosen vocation, to vote, to hold public office). Deprivation of the opportunity to apply for public funding in no way resembles the clear scope of a bill of attainder punishment as determined by SCOTUS. Thus, plaintiffs may argue that deprivation of the opportunity to apply for public funding is unfair, and a violation of Due Process and/or Equal Protection - but that deprivation is clearly and explicitly not a legislative punishment as evinced by the Bill of Attainder clause. Next, Gershon moves on to explaining why the statute is punitive. I see no need to discuss either the functional test or the legislative history, as without a justifiable bill of attainder punishment, the question of the punitive nature of the statute is irrelevant. Without a legislative punishment, the statute by definition cannot be punitive. This point is quite clear - and that the ACORN statute fails to meet this criterion is equally clear. Had the government, as a result of the ACORN statute, not fulfilled its current contractual obligations to ACORN, then plaintiffs would have had an ex post facto argument; however, as Gershon explains at the beginning of her decision, the government has agreed to fulfill all contractual obligations, and ACORN is not pursuing an ex post facto argument. None of the funds available by this joint resolution or any prior Act may be provided to the Association of Community Organizations for Reform Now (ACORN), or any of its affiliates, subsidiaries, or allied organizations. Essentially, as the order is written, if any of the listed government agencies denies any future grant or contract to ACORN, it can be accused of violating Judge Gershon's order. In other words, Gershon has just granted ACORN a constitutional right to public funds. Unfortunately for Judge Gershon, the Constitution grants the right of appropriation of public funds to the Legislature, not to the Judiciary. It’s noteworthy that in discussing the Bill of Attainder Clause of the Constitution, the district court failed to discuss at all the Appropriations Clause. That provision states that, “No money shall be drawn from the Treasury, but in consequence of appropriations made by law.” In other words, only Congress can dole out federal dollars. The court fails to consider whether it has the authority to order the executive branch (the Treasury Department) to continue giving federal dollars to ACORN after the legislative branch (Congress) with sole possession of the power of the purse has specifically passed a law barring any such appropriation. This opinion doesn’t even raise the separation-of-powers issue of a court dictating federal spending. By enjoining every government agency with any contact with ACORN against denying ACORN any public funds, Gershon has compelled the Legislature to appropriate funds against the expressed prerogative of the Legislature. Further, this ruling sets the precedent for any other government contractor for whom a contract (or grant) is cancelled, or not renewed, to petition the courts on a Bill of Attainder claim. This ruling is a clear case of liberal judicial activism and malfeasance, and represents a frontal assault on the Constitution. Surely SCOTUS will vacate this decision and put Judge Gershon in her place - although, after such a decision, her place is off the federal bench entirely. Life expectancy statistics do not satisfy this three-pronged requirement; in fact, it fails at least two out of three. Life expectancy cannot be assumed to have actual interaction with the health care system. Note that Accidents (including motor vehicle accidents), Suicide, and Homicide cannot be assumed to have actual interaction with the health care system (with suicide being a possible exception). In fact, when adjusting for such non-health-related fatal injuries, the US ranks #1 in the world in Life Expectancy - indicating that, for those causes of death that can be assumed to have actual interaction with the health care system, the US health care system is the best in the world. Given the leading causes of death, life expectancy does not measure phenomena that the US health care system can actually affect. Consider the three leading causes of death: Heart Disease (30%), Cancer (23%), and Stroke (7%) cause 60% of all deaths in the US. These diseases are almost entirely caused by behavioral/lifestyle choices (diet, exercise, smoking, etc.). Including Chronic Lower Respiratory Disease (4%), which is caused almost entirely by smoking, and Diabetes (3%), which is caused almost entirely by diet, and fully 2/3 of all deaths in the US are caused by lifestyle and behavior choices over which the US health care system has no control or impact. Also including accidents (5%), the US health care system has no control over or impact on more than 70% of all deaths in the US. Other studies have concluded that eradicating cancer deaths would increase life expectancy by 2.7 years, and eradicating risks from heart disease, stroke, and diabetes would increase life expectancy by 14 years. 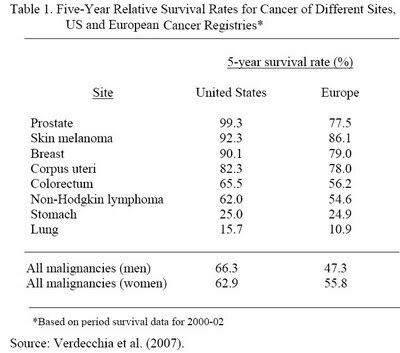 And apparently, the Europeans didn't include cancers discovered only upon death - which further skews the disparity. Clearly, to the extent that the health care system has an impact on diagnosis and treatment of cancer, the US health care system far surpasses the health care systems in Europe - and Canada, too, for that matter. It is a matter of efficacy, not of efficiency; thus, health care spending per capita or as a percentage of GDP is irrelevant. The point is that the US health care system is more efficacious with respect to diagnosis and treatment of cancer - a result that provides one argument to refute the assertion that life expectancy is a valid metric of quality of health care. Presumably, some of that increased spending in the US health care system goes to earlier and more frequent testing, which leads to commensurately earlier and more frequent diagnosis. Thus, the argument that the increased efficacy merely represents increased diagnosis rather than a quantifiable difference in quality of health care is tautological; as an argument, it is specious. With respect to cancer, timing of diagnosis is critical to successful treatment. As has already been demonstrated, behavioral/lifestyle choices such as diet, exercise, and smoking are the primary contributors to the leading causes of death in the US. Other studies show a correlation between life expectancy and sanitation, clean water, income, and literacy rate. The CDC indicates that improvement in life expectancy in the 20th century can be partially attributed to vaccination, motor vehicle safety, safer workplaces, control of infectious diseases, decline in CHD deaths, safer/healthier foods, healthier mothers/pre-natal care, family planning, fluoridation of drinking water, reduction of tobacco. Yet other studies have identified marriage, religious involvement, optimism, and cleaner air as having positive impact on life expectancy. Life expectancy is not a meaningful metric of quality of health care. The health care system cannot be assumed to have an actual interaction with several of the leading causes of death in the US. More than 70% of the deaths in the US result from causes stemming from behavioral and lifestyle choices over which the health care system has no control or impact. For those causes of death upon which the health care system has some impact, the US health care system proves to be far more efficacious than the nationalized health care systems with which it is compared. As my mother has always said: if it ain't broke, don't fix it - especially when the "fix" is government-controlled health care. Recently, an 18-year-old Canadian girl died in an ambulance en-route to the hospital, due to injuries suffered in a car accident. The ambulance ride apparently took approximately 30 minutes to reach the Welland hospital, during which time the ambulance was rumored to have run out of oxygen. Ms. Anzovino, desparately in need of a blood transfusion, died shortly before arrival, due to internal bleeding. Local authorities have opened an inquiry into the situation, because the girl died while en-route to the emergency room - an emergency room at a hospital two towns away, because the emergency rooms at the two nearest hospitals had been closed. For reference, see the map to the right. At this point it might be helpful to clarify the different categories of medical emergencies. Basically, an emergency is a threat to life or limb. There are ordinary everyday emergencies and then there are time-critical emergencies. Time-critical emergencies require rapid attention, else death is an imminent risk. Along with all other emergencies, the time-critical ones routinely came directly to the ER where they were promptly moved to the head of the line and dealt with, within minutes, without fanfare. Hence they were next to ‘invisible’ as a type. By downgrading and bypassing ERs, forcing these problems out onto the highway in an ambulance, the non-medical managers have ‘created’ a new and visible time-critical type of emergency. These new time-critical emergencies are really bureaucratic artifacts. Specifically, people with gunshot wounds in vital areas, unconscious people with difficulty breathing, people in shock bleeding massively, people with drug overdoses, people in anaphylactic shock, people with head injuries, and many more (I cant list them all), are the ones that would ordinarily be those moved to the head of the ER line. If they cannot be put at the head of the line because they are on an ambulance that has bypassed the hospital and is out there somewhere on the highway on a trip to a place too far away, they may just die in that ambulance. And that is in spite of all the good intentions of fine paramedics, for there are still certain things that only a doctor at a hospital can do. We are building a health care system in Ontario where every person in Ontario has access to the very best possible care as close to home as possible. Having said that, the reality is that sometimes people will have to travel to another community to be able to access the highly specialized care that is part of today’s health care system. I think people understand that we cannot provide highly specialized care in every community hospital. When it comes to emergency care, it’s vitally important, absolutely essential, that people get to where that specialized care is available as quickly as possible. I am absolutely convinced that the people in Niagara have better quality health care now than they did before. Tell that to the family of Reilly Anzovino. Nevermind that the closures are causing a quantifiable delay in emergency care. According to this article, the ambulances, paramedics, and patients are delayed an average of eight hours daily, and hours of wait-time have increased from 130 to 240 hours per month at the Niagra Falls Hospital, due to the shortage of emergency departments in the months since the closures. And the closures were supposedly necessary due to budget shortages, despite a 42% spending increase on health care in the Niagra Region in the past six years. Aside from the emergency department closures, the region has experienced increased emergency-room wait times, delay and cancellation of surgeries (including serious cancer surgeries), increased hospital-bed closures, and an above-average death rate. And liberals in the U.S. still wonder why the vast majority of Americans oppose nationalized health care? Special note: Anzovino's parents have established a memorial scholarship for paramedic students, in their daughter's name. Details here. Tonight at Papagayos in Maplewood, MO, pro-democracy Hondurans and Americans rallied in support of the constitutional government and President Roberto Micheletti, and against would-be dictator Manuel Zelaya and the despicable actions of the Obama administration. I had the honor of being present, and standing with the St. Louis Honduran community in support of their desire for freedom and constitutional democracy. I estimated approximately 50-60 in attendance. No counter-protesters showed up. The passing traffic seemed mostly supportive and/or apathetic. I only saw one car that shouted expletives at the rally crowd. The rally featured several speakers, including Jim Hoft of Gateway Pundit. I’m really getting sick of supporters of ObamaCare admonishing those who oppose it to read the bill. So, I’m working on a series in which I do just that, framing my opposition to the bill by referencing the actual wording of the proposed legislation. Up next: HR3200’s tax on individuals without acceptable healthcare coverage, and debunking President Obama's lie that ObamaCare does not impose such a tax. STEPHANOPOULOS: That may be, but it's still a tax increase. OBAMA: No. That's not true, George. The -- for us to say that you've got to take a responsibility to get health insurance is absolutely not a tax increase. What it's saying is, is that we're not going to have other people carrying your burdens for you anymore than the fact that right now everybody in America, just about, has to get auto insurance. Nobody considers that a tax increase. People say to themselves, that is a fair way to make sure that if you hit my car, that I'm not covering all the costs. OBAMA: No, but -- but, George, you -- you can't just make up that language and decide that that's called a tax increase. Jim Hoft and Bob Leibowitz go on to discuss Stephanopoulos reading Obama the dictionary definition of a tax, and Obama claiming that he was "stretching" the meaning of a tax by quoting the dictionary. Theirs is certainly valid criticism, but I want to look at the wording of the bill itself, which likewise proves Obama to be telling yet another bald-faced lie. ‘‘SUBPART A. TAX ON INDIVIDUALS WITHOUT ACCEPTABLE HEALTH CARE COVERAGE. ‘‘SEC. 59B. TAX ON INDIVIDUALS WITHOUT ACCEPTABLE HEALTH CARE COVERAGE. ‘‘the taxpayer’s modified adjusted gross income for the taxable year, over the amount of gross income specified in section 6012(a)(1) with respect to the taxpayer. This section is fairly straight-forward, and its intent is clear: if you do not pay for ObamaCare-approved health coverage, the IRS will impose a tax on you. The bill amends the IRS tax code, to define a new tax: a tax for failure to maintain acceptable health coverage. So: a given individual is not paying a certain tax now, but under ObamaCare, that same individual will be paying that tax. That outcome is, by definition, a tax increase. 4 section 6012(a)(1) with respect to the taxpayer. Up next: HR3200's hostility toward Small and Medium Businesses (SMBs) that self-insure. The Commissioner, in coordination with the Secretary of Health and Human Services and the Secretary of Labor, shall conduct a study of the large group insured and self-insured employer health care markets. Such study shall examine...[t]he financial solvency and capital reserve levels of employers that self-insure by employer size. Now, I'm not a businessperson; I'm just an engineer. That said, I don't understand how one can "examine...[t]he financial solvency and capital reserve levels" of a company without looking at that company's books. I have seen the argument from the left that this information is available in normal IRS paperwork, but I don't think so. Such IRS documents involve a company's income, expenditures, and losses for a given fiscal year. "Financial solvency and capital reserve levels" cannot be gleaned solely from such data. Perhaps this information can be gleaned from the publicly available annual financial reports; however, publicly traded companies (which are the ones required to publish annual financial reports) are, I would assume, less likely to self-insure. It is the SMBs that would be most likely to self-insure - and at the same time, less likely to be publicly traded and therefore less likely to publish annual financial reports. So, from where will the Commissioner get these data, without auditing the books of companies that self-insure? Such report shall include any recommendations the Commissioner deems appropriate to ensure that the law does not provide incentives for small and mid-size employers to self-insure or create adverse selection in the risk pools of large group insurers and self-insured employers. SEC. 4376. SELF-INSURED HEALTH PLANS. (a) IMPOSITION OF FEE.—In the case of any applicable self-insured health plan for each plan year, there is hereby imposed a fee equal to the fair share per capita amount determined under section 9511(c)(1) multiplied by the average number of lives covered under the plan. (1) IN GENERAL.—The fee imposed by subsection (a) shall be paid by the plan sponsor. Subject to subparagraph (B), the fair share per capita amount under this paragraph for a fiscal year (beginning with fiscal year 2013) is an amount computed by the Secretary of Health and Human Services for such fiscal year that, when applied under this section and subchapter B of chapter 34 of the Internal Revenue Code of 1986, will result in revenues to the CERTF of $375,000,000 for the fiscal year. In other words, take $375 million, divide by the total of all employees under an employer self-insurance plan, and you get the "fair share per capita amount". According to this report, 73 million Americans were in self-insurance plans in 2007. Using this number, employers who self-insure will be taxed at least $5 per employee, just to help fund the Health Care Comparative Effectiveness Research Trust Fund (CERTF). SMBs that self-insure will be subjected to auditing in order to examine... financial solvency and capital reserve levels"
Recommendations will be made to ensure that tax laws "does not provide incentives for small and mid-size employers to self-insure"
5 products versus those that self-insure. 7 cluding updates on such recommendations. 1 ‘‘SEC. 4376. SELF-INSURED HEALTH PLANS. 6 the average number of lives covered under the plan. 9 section (a) shall be paid by the plan sponsor. 10 defined in section 3(40)(B)(v) of such Act). 16 $375,000,000 for the fiscal year. 24 under clause (ii) for the fiscal year. 15 (II) shall be rounded to the nearest penny. I'm really getting sick of supporters of ObamaCare admonishing those who oppose it to read the bill. So, I'm starting a series in which I do just that, framing my opposition to the bill by referencing the actual wording of the proposed legislation. Up first: Obama's claim that "if you like your current plan, you can keep it." This claim is a bald-faced lie, and one that I will demonstrate using the wording of the bill itself. Whatever your private insurance coverage is today, whether or not you are satisfied with it, you will be forced to move to another plan by 2018. First, some background. Page 14 defines "Y1" through "Y5" as years 2013 and following. So, anything in the bill that takes place in Y1 takes place in 2013, and Y5 in 2017. IN GENERAL.—Individual health insurance coverage that is not grandfathered health insurance coverage under subsection (a) may only be offered on or after the first day of Y1 as an Exchange-participating health benefits plan. We can establish thus far that, as of January 1, 2013, all health insurance plans must be either a) an "Exchange-participating" benefits plan, or b) a grandfathered plan. An "Exchange-participating" benefits plan is, essentially, any plan that is "qualified" under HR 3200, according to qualification rules that will be determined and implemented by the government. So, what is a "grandfathered" plan? From the rhetoric coming from Obama, one would assume that all currently existing plans would be "grandfathered". Not so. (A) IN GENERAL.—Except as provided in this paragraph, the individual health insurance issuer offering such coverage does not enroll any individual in such coverage if the first effective date of coverage is on or after the first day of Y1. (B) DEPENDENT COVERAGE PERMITTED.—Subparagraph (A) shall not affect the subsequent enrollment of a dependent of an individual who is covered as of such first day. (2) LIMITATION ON CHANGES IN TERMS OR CONDITIONS.—Subject to paragraph (3) and except as required by law, the issuer does not change any of its terms or conditions, including benefits and cost-sharing, from those in effect as of the day before the first day of Y1. Now, how tenable are those requirements? Not very. Are you insured through your employer? Do you think that your company will hire any new employees on or after January 1, 2013? Do you think that your employer will want to add those new employees to the company insurance plan? Do you think that your company might want to negotiate new or better coverage, or changes to deductibles, or make any other routine changes to your plan? Of course. And if so, your insurance plan will no longer be grandfathered. Once it is no longer grandfathered, it will be subject to government control and subject to the requirements and qualifications for "Exchange-participating" plans. However, let's make the extreme assumption that such a plan will exist, and will remain viable. You're in the clear, right? You'll be able to keep that coverage for as long as your grandfathered plan doesn't change and doesn't enroll any new members, right? IN GENERAL.—The Commissioner shall establish a grace period whereby, for plan years beginning after the end of the 5-year period beginning with Y1, an employment-based health plan in operation as of the day before the first day of Y1 must meet the same requirements as apply to a qualified health benefits plan under section 101, including the essential benefit package requirement under section 121. Now, what is "an employment-based health plan in operation as of the day before the first day of Y1"? You guessed it: an otherwise "grandfathered" plan. This clause clearly indicates that "grandfathered" plans are only truly grandfathered for the first five years (2013-2017). After this "grace period", all pre-existing employment-based health plans will be subject to government control and subject to the requirements and qualifications for "Exchange-participating" plans. Thus, we have indisputably established that, according to the wording of HR 3200, you will be forced into a different health coverage plan from the one you have today, by 2018. 24 erage, essential benefits, and other consumer protections. 7 (1) Subtitle B (relating to affordable coverage). 8 (2) Subtitle C (relating to essential benefits). 18 curity Act of 1974) in such plan. 25 Public Health Service Act. 20 individual who is covered as of such first day. 26 fore the first day of Y1. 19 benefit package requirement under section 121. 4 of 2009 (Public Law 111–5). 22 treated as acceptable coverage under this division. 5 ticipating health benefits plan.